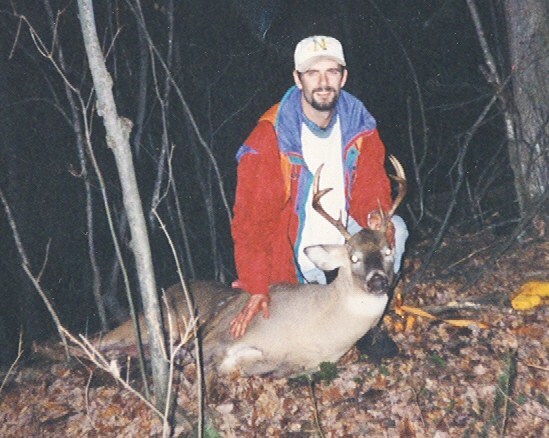 Posted on Tue, Nov 15, 2011 : 5:58 a.m.
Rick Taylor with an eight-point buck he shot his first time hunting while attending Northern Michigan University. I was on my way home from a business class while attending Northern Michigan University; the year was 1994. A blizzard had engulfed Marquette, and I was fighting the winter winds all the way back to my house that I shared with four other students. I couldn’t prevent the snow from going down the back of my neck no matter how hard I leaned forward. Finally, I’m at my front door and shove myself into the house. I shake the snow off my gloves and coat and begin to dress down from an all-too-familiar weather pattern in the Upper Peninsula. One of my roommates was in the kitchen while the other guys are watching ESPN. My nose picked up the savory smells of garlic, mushrooms, butter and some meat; it smelled delicious, especially on a cold day like that today. "What are you cooking Chris?" I asked. Chris looked over his shoulder and yelled, "I’ve got some venison back straps buddy"
"What’s venison?" I asked and the room fell eerily quiet. Everyone stopped talking and snapped their heads in my direction as if I just insulted the Mother Theresa. "What’s venison? You’re kidding, right?" they asked. I looked at them and truly had no idea what they were talking about. "Venison is deer meat, you dummy," said Chris. I couldn’t believe these guys would eat any wild animal. I knew I wasn’t going to do that. "Come over here Rick and give it a try," said Chris. "No way, that’s disgusting," I said. But, Chris got his way, and I reluctantly tried the deer meat for the very first time. Wow! That was delicious, and the guys all laughed it up and welcomed me to eating wild game. My life changed forever that day, and I've never thanked Chris Bjork properly. It's important you all know that I come from a family who doesn't hunt. I’d say that our family might be considered anti-hunters, to be more specific. You see, I wasn’t born into the hunting world, and I certainly didn’t know anything about archery or firearms. It's taken me years to become proficient, and learning is half the fun. I found myself in the woods with a borrowed shotgun two weeks after my first taste of venison. I had no previous experience, but I enjoyed the taste of venison so much that I thought I'd try hunting. I had a Columbia ski jacket on and a plastic orange vest. I looked like a first-time deer hunter, but luck was on my side that day. 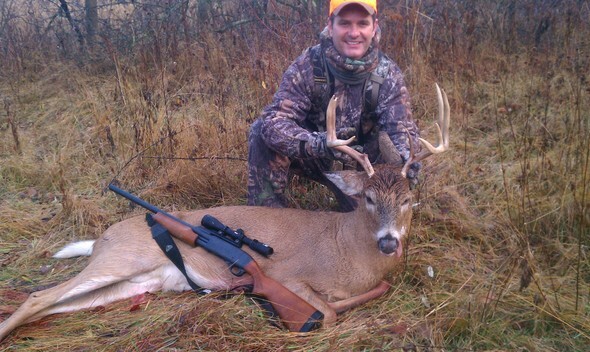 I shot an eight-point buck my first time out and have enjoyed opening day of the Michigan firearm season since 1994. Proper scouting led to this successful hunt and plenty of meat in the freezer. There are more than 700,000 hunters in Michigan, ranking in the top-three hunting states every year. The state has even taken first place as having the most hunters in the country from time to time. $1.3 billion dollars was spent last year on hunting alone in Michigan. That amount triples when you include fishing. Let's face it: there are a lot of hunters in our beautiful state. Believe it or not, there are a lot of hunters who reside in Ann Arbor as well. I get a lot of emails from people who live in Ann Arbor who hunt and like this column. Nov. 15 marks the opening day of firearm season in Michigan. So, be careful out there today. Shoot straight. Send me your photos, and the best picture and/or story will be featured in my column. UPDATE: Rick sent in this photo of opening morning. 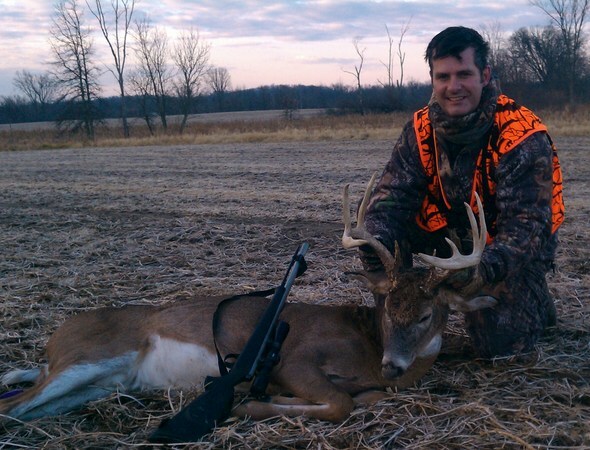 Rick Taylor shot an 8 point buck in Washtenaw County on Nov. 15, 2011, opening morning of the Michigan firearm season. Rick Taylor can be reached at 734-223-5656 or by email at rtaylor@reinhartrealtors.com. Wed, Nov 16, 2011 : 2:47 a.m. Deer video time. I just saw the cutest video of a sheriff up in the UP carrying a baby doe to the side of the road. The thing was swiped by a car, stunned and starring out into nothing. The sheriff swooped in, petted it, picked it up and carried it to the side of the road. The doe took off after a while, but wow. Nice story. It is on you tube. Swartz area I think. Tue, Nov 15, 2011 : 7:03 p.m.
Tue, Nov 15, 2011 : 7:07 p.m.
My reply (above) was to a reply by jsn under the third post above by abc. jns wrote, &quot;AAPS let you teach a rifle course? Wow. Times sure have changed.&quot; Sorry for putting it in the wrong place. Tue, Nov 15, 2011 : 6:30 p.m.
Hunter Safety is required for all new hunters born before 1960 OR a previous hunting license. But, when was the last time you were asked for either? Hunter Safety is an honor system I am happy so many do take the class. A few die every year that break some of those simple rules. How come those that dish out the licenses are allowed to refuse Hunter Safety instructors from posting their class? Remember, the safety is a mechanical device and subject to failure. Tue, Nov 15, 2011 : 4:53 p.m.
Tue, Nov 15, 2011 : 9:58 p.m.
mmmmm Pan seared backstraps, fried onions and taters for dinner tonight Rick? Great job on the article and on your opening day 8. I hope to get out this weekend and fill the freezer. Tue, Nov 15, 2011 : 6:20 p.m.
Rick, Thanks for responding. I would not want a reader thinking that all it took to get a hunting license today was to pay the state. A hunter safety course is required for all first time hunters born after January 1, 1960. Tue, Nov 15, 2011 : 4:12 p.m.
Nice read. And while I do not hunt, my father does. Responsible hunting is a great boost to the MI economy and indeed does control the deer population. I'm all for it. However, I'm against bait piles and large-scale feeding for &quot;hunting&quot; purposes. I imagine most serious hunters are as well. Tue, Nov 15, 2011 : 3:32 p.m. I was at a horse ranch recently and they told me horses are considered prey animals too. How sad. I do know people eat horse meat over in Japan, but seriously, I would much prefer to see these guys out on the road scaring me half to death then on my dining room table. Nice article, but no thanks. Tue, Nov 15, 2011 : 2:36 p.m. I think anyone who eats meat bought from the supermarket on a regular basis really needs to look in the mirror when they point fingers about &quot;killing.&quot; As someone who doesn't eat meat and hasn't for the last 18 years, I respect someone who kills his own meat in a hands-on and respectful way much more than someone who never thinks about the ethics of meat and buys pre-wrapped, hormone-injected cuts of meat at the grocery store. Another nice story, Rick! Tue, Nov 15, 2011 : 2:02 p.m.
As long as the hunters eat the meat or donate the meat so that it can be eaten by someone then I have no problem with hunting. Fact of the matter is the deer population in Michigan is far too large and this is one of the best methods of keeping their numbers in check. I would rather some hunter shoot and eat a deer than have it run across the road and cause some poor human to be hurt or killed in a car wreck. Wed, Nov 16, 2011 : 2:51 a.m. Unlike what I replied below. A sheriff helping a doe to the side of the road. This is on You Tube. I just saw it. The video is from the sheriffs car. Loved it. Tue, Nov 15, 2011 : 3:44 p.m. Some one just hit a deer on our road last night. Instead of calling the sheriff to put the poor thing out of its misery, they just drove off. That driver was not a &quot;poor human&quot;, he was a thoughtless human. We called the sheriff, by the way. Tue, Nov 15, 2011 : 1:50 p.m.
Tue, Nov 15, 2011 : 1:20 p.m. I also wasn't brought up as a hunter, just a rabid angler, but I adapted. It takes some work and it helps if you have a mentor, but don't think its impossible to get into hunting from scratch. It's not even necessary to own or use firearms if you can get out in the bow season enough, though you will have to get used to deer getting by you out of range very frequently. Tue, Nov 15, 2011 : 6:54 p.m. I've never met any hunter or a farmer who was like your idea. I don't think any are writing here. Tue, Nov 15, 2011 : 3:38 p.m. It's not eating meat or not eating meat, you just don't get it! It's the idea that some hunters get a thrill out of killing some living thing. That is wrong. Period. Tue, Nov 15, 2011 : 1:07 p.m.
How sad that killing gives you such happiness.... Just saying! Tue, Nov 15, 2011 : 6:11 p.m.
How sad that being a hypocrite brings you happiness...Just saying! Ever buy meat at the supermarket or at a restaurant and wonder what &quot;humane&quot; methods were used to bring that meat to you? Tue, Nov 15, 2011 : 2:09 p.m.
Maybe you mean &quot;just making it up&quot;. Ever killed chickens, turkeys, or lambs, or had other do it for you, and did that bring you happiness? Thanksgiving turkey might bring me and others some happiness, but it won't be because I killed something. Tue, Nov 15, 2011 : 12:57 p.m. There's nothing like being in the Michigan woods in November. When you hunt, you can feed your family, decorate your home (with buckskin, feathers, antlers, etc. ), create great shared memories, and learn proper handling of firearms. What a great heritage for Americans! Tue, Nov 15, 2011 : 12:22 p.m.
you got all the way to college (in Michigan) and didn't know the word &quot;venison&quot;? Tue, Nov 15, 2011 : 12:21 p.m.
&quot;I found myself in the woods with a borrowed shotgun two weeks after my first taste of venison. I had no previous experience...&quot; How were you able to arrange for, and pass, your hunter safety course in just two weeks? Please explain. Tue, Nov 15, 2011 : 3:35 p.m.
AAPS let you teach a rifle course? Wow. Times sure have changed. I know most of my Tappan teachers are now retired, but that sure brought back memories. Tue, Nov 15, 2011 : 3:07 p.m.
Craig - It was a new requirement in the early 70's. It might have been for young hunters, only. Perhaps the author of this article was old enough to be exempt. I don't really remember what the rules were back then, or now. But it would be a good idea for all ages regardless, especially for a novice hunter who has never hunted, or perhaps never even handled a firearm. I know that I have felt unsafe around some careless firearms handling by nearby hunters in the field, and more than once was in the line of fire. A hunting buddy and I were well hidden in a marsh in Waterloo Rec. Area hunting ducks when some squirrel hunters came up on the bank and couldn't believe their luck - there was a whole flock of ducks on the water just waiting to be shot. Of course, it was our decoys, and one of them shot before we could yell, and he sank one of them. Shot tore through the cattails all around us. It was very frightening, and when we screamed at them, they just turned and walked away without a word of apology. Tue, Nov 15, 2011 : 2:21 p.m. The one and only time I ever hunted was in the late 60's. I had a license but I do not think I took any safety class to get it. Tue, Nov 15, 2011 : 2:12 p.m. I was wondering the same thing. I taught hunter safety courses in the early 70's at Tappan Junior High. I taught English and social studies, and offered this as an after school class over a number of weeks. I followed a DNR curriculum. As I recall, in order to buy a hunting license, one had to either pass this course or have a previous hunting license. Tue, Nov 15, 2011 : 12:23 p.m.
maybe rules were different 17 years ago in 1994? I don't know, just asking. I feel sorry for these beautiful creatures -- being stalked and shot, etc. Tue, Nov 15, 2011 : 6:07 p.m.
Much more humane than suffering after being hit by a car and left at the side of the road to suffer or go to waste. Not to mention, may save a humans life that may be in said car by controlling the deer population. Tue, Nov 15, 2011 : 11:55 a.m.